By becoming an Oblate of Saint Benedict, Christian men or women choose to associate themselves with a Benedictine religious community in order to strengthen their baptismal commitment and enrich their Christian way of life. It is not known when the first medal of Saint Benedict was struck. At some point in history, a series of capital letters was placed around the large figure of the cross on the reverse side of the medal. For a long time the meaning of these letters was unknown, but in 1647 a manuscript dating back to 1415 was found at the Abbey of Metten, Bavaria, giving an explanation of the letters. The Jubilee medal (front) was struck in 1880 under the supervision of the monks of Montecassino, Italy, to mark the 1400th anniversary of the birth of Saint Benedict. The design of this medal was produced at St. Martin's Archabbey, Beuron, Germany, at the request of the prior of Montecassino, Archabbot Boniface Krug O.S.B. (1838-1909). Boniface Krug was a native of Baltimore and originally a monk of Saint Vincent Archabbey, Latrobe, Pennsylvania, until he was chosen to as Archabbot of Montecassino. In St. Benedict's left hand is his Rule for Monasteries that could well be summed up in the words of the Prologue exhorting us to "walk in God's ways, with the Gospel as our guide." On a pedestal to the right of St. Benedict is the poisoned cup, shattered when he made the sign of the cross over it. On a pedestal to the left is a raven about to carry away a loaf of poisoned bread that a jealous enemy had sent to St. Benedict. Above the cup and the raven are the Latin words: Crux s. patris Benedicti (The Cross of our holy father Benedict). On the margin of the medal, encircling the figure of Benedict, are the Latin words: Eius in obitu nostro praesentia muniamur! (May we be strengthened by his presence in the hour of our death!). 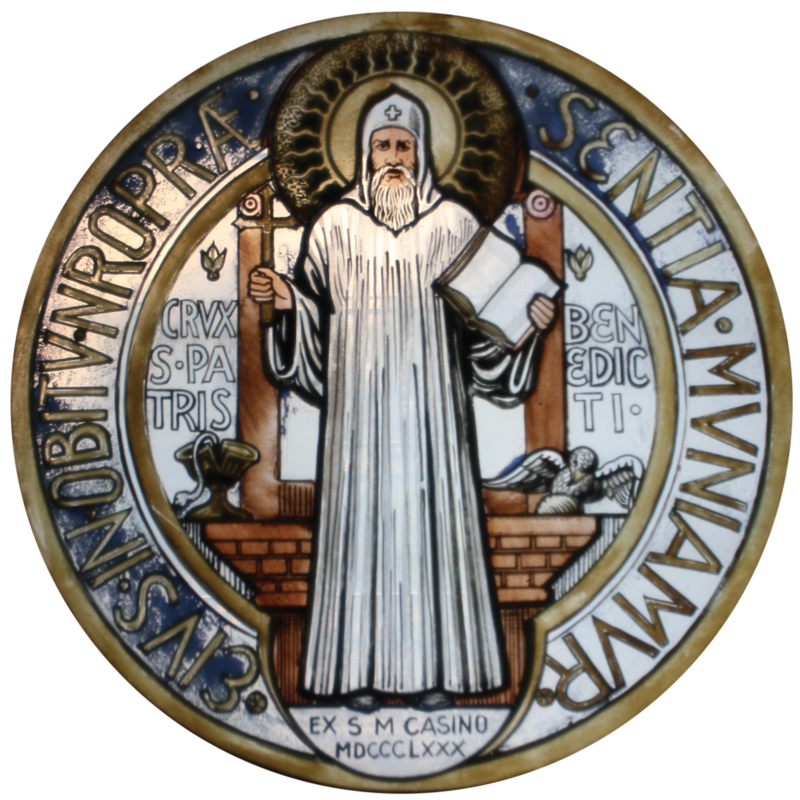 Benedictines have always regarded St. Benedict as a special patron of a happy death. He himself died in the chapel at Montecassino while standing with his arms raised up to heaven, supported by the brothers of the monastery, shortly after Saint Benedict had received Holy Communion. On the back of the medal, the cross is dominant. On the arms of the cross are the initial letters of a rhythmic Latin prayer: Crux sacra sit mihi lux! Nunquam draco sit mihi dux! (May the holy cross be my light! May the dragon never be my guide!). In the angles of the cross, the letters C. S. P. B. stand for Crux Sancti Patris Benedicti (The cross of our holy father Benedict).